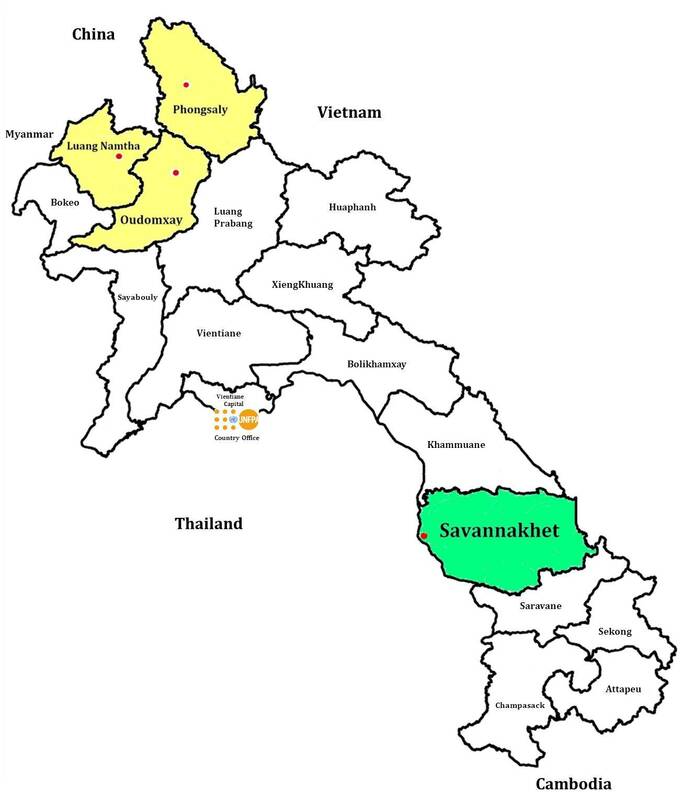 Lao PDR is a landlocked and Least Developed Country bordering China, Viet Nam, Cambodia, Thailand and Myanmar. About 6.25 million people live in its 17 provinces. Most people - 67 percent - still live in rural areas. However, urbanization is occurring at a rate of 4.9 percent each year. The country is largely mountainous, with the most fertile land found along the Mekong plains. The river flows from north to south, forming the border with Thailand for more than 60 percent of its length. Large population centres (including Vientiane, Luang Prabang, Pakse and Savannakhet) lie on the Mekong. The population of Laos is diverse, with 49 broad ethnic groups recognised by the Government of Laos, and four major linguistic groups. The largest language group, the Lao-Tai, consists of eight ethnic groups. Forming around 35 per cent of the total population (roughly encompassing what was previously referred to as the Lao Loum population), this group is politically and culturally dominant within Laos. Theravada Buddhism, the dominant religion of Laos, is followed by approximately 60 per cent of the population, and a higher proportion of members of the Lao-Tai language ethnic groups. Animism is still widely practiced among a number of minority groups, especially in the more remote rural areas. Availability, analysis and utilisation of data for development. UNFPA is one of the UN agencies assisting the `Support to an Effective Lao National Assembly' (SELNA) joint programme. The UNFPA country office has within this context focused on strategically working with the National Assembly, through the Social and Cultural committee as an entry point, to advocate and lobby for increased response at the policy-level to issues related to women's health as well as adolescents and youth. This is key in our upstream work. All the work is enabled by providing technical assistance to the relevant government partners to generate and use data as evidence to influence dialogue both upstream and downstream in our work, while being gender responsive consistently. We have broken down the silos and worked together in the context of the new UNFPA business plan where we focus specifically on the two clusters, women's health and adolescents and youth. This has helped us to focus programmatically on few tangible results, and aim for effectiveness and efficiency. The data assisted us to work with government to strategically identify needy regions and thus focus our downstream support in selected geographic areas in the country, specifically in four provinces: Luang Namtha, Phongsaly, Oudomxay and Savannakhet.